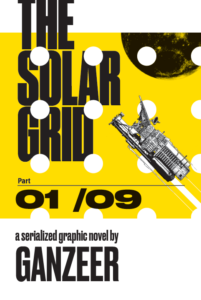 In the first chapter of a topical digital sci-fi comic called The Solar Grid from Egyptian street artist, writer, graphic designer, and critic Ganzeer, “human civilization is in ruins.” Or so says an underling at Skyquench, a malicious corporate giant at the center of an unflattering investigative newspaper story that has journalist Buster Bethlehem suspected of terrorism for reporting it. Ganzeer sets these 38 black and white pages in a post-apocalyptic era that appears to have followed a “Great Flood.” Skyquench’s alleged crime relates to water — specifically, to the company’s business decision to send the scarce resource it has harvested on Earth to another planet — and its efforts to cover it up. As improbable as it is that there might still be newspapers at any point in even the near future let alone the far-off post-apocalyptic state that Ganzeer envisions, his water crisis element, the renderings of hollow cable TV news punditry, and assault on press freedoms (all of which are very personal for the artist) feel very on-the-mark. Tech and media are front and center in grayed-out security cam footage, personalized targeted advertisements, and blocky message bubbles via Bethlehem’s chat app. Panels jut out and the action frequently crashes the gutters, bumping up against an incorporation of fierce design acumen. An overall scrappy, Kinko’s Copy Center-styled zine feel reminded me of Brian Wood’s Channel Zero, and it emphasizes an already jittery pace that The Solar Grid has baked-in, even in its first part. 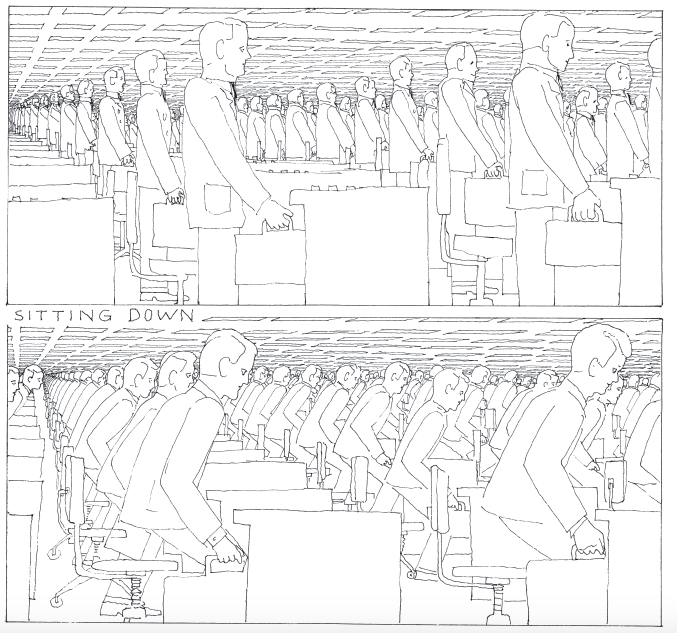 A different brand of dizziness will wash over readers of Soft City, a longform comic (or perhaps proto-graphic novel) finished in 1975 by Norwegian pop artist Hariton Pushwagner. It’s part of the line from New York Review Comics, an imprint of New York Review Books that was launched in the spring of 2016. 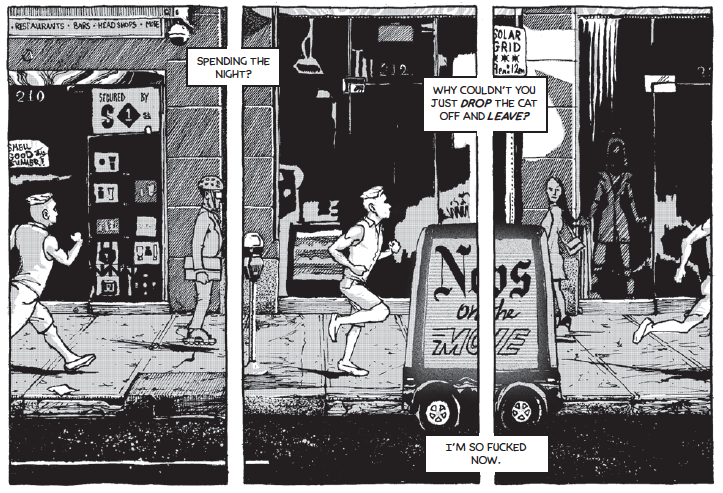 NYRC is issuing first-time English translations of comics and odd, out-of-print graphic novels, and the slate includes works by French comics artist Blutch, a collection of cartoons from Glen Baxter (whose body of work stretches back over four decades), and more. Soft City doesn’t yield a story as much as it does an observation. Its sprawling exploration of lifeless, worker-bee mundanity in a monochrome city and adjacent suburb — framed within Pushwagner’s single inked line — got the statuesque hardcover treatment (with an intro from cartoonist and writer Chris Ware), as it stands over thirteen inches tall on the table. Countless rows of apartment complex windows in Soft City reveal uniform, indistinct living spaces, where hordes of suited men prepare for a day at an office illuminated by the rows of fluorescent lights that Pushwagner stacks in imperfect rows of slats on the ceiling. Assembly lines of desks are bare boxes, hardly set apart from the briefcases and chairs nearby. Marketing copy is reduced to the meaningless drivel it usually is, as Pushwagner peppers his nightmarish visualization of the mass production of military weaponry, consumerism, and feckless complacency with curt stock phrases and creepy, repeat instances of the word “soft” that seem as if they’ve been clipped from catalogs or old magazine ads. And these pages — crafted between 1969 and 1975 but nearly lost to history were it not for the courts — read as both surreal and startlingly poignant almost fifty years after the first few sketches came to fruition. Karen Green, Columbia University Librarian for Ancient & Medieval History as well as its comics curator, saw the book at the Museum of Comic and Cartoon Arts Festival in New York City in 2009. 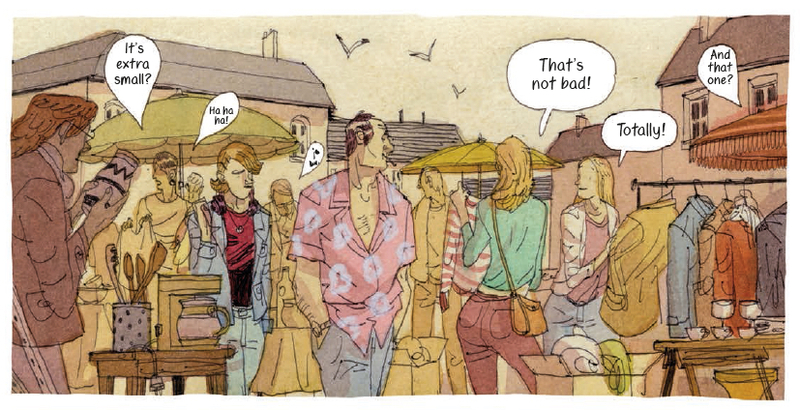 Whether it’s directly related to the scene at hand or not, dialogue in Equinoxes, a 2015 French graphic novel that has seen an English translation this year from comics publisher NBM, is frequently a part of exposition for award-winning comics creator and animator Cyril Pedrosa. He demonstrates a proficiency in scene-painting early in his new book — which (so far, for me) is a complicated exploration of familial relationships, connectedness with a political movement, and more that is sectioned-off by seasons — although his readers already know him to be a scrupulous observer. Pedrosa is best known for Portugal, an award-winning graphic novel at the Angoulême International Comics Festival that he called “fifty percent autobiographical” during a stop on the Equinoxes press tour. At Albertine bookstore in Manhattan in September, Pedrosa spoke with Brooklyn-based autobio comics creator Gabrielle Bell and critic and Best American Comics Series Editor Bill Kartalopoulos. The discussion mostly revolved around the shared traits between Pedrosa’s work and that of Bell, whose funny and intimate graphic memoirs, such as 2014’s Truth is Fragmentary, are as indebted to her keen observational sensibility as they are to off-kilter humor. Bell espoused the benefits of taking photographs for reference while both talked about keeping extensive notes that they’ll use when drawing their comics. Pedrosa explained that the monologues in Equinoxes — pages of straight, detail-heavy prose and abstract overlays that break up the comics pages (initiated, fittingly, by a photographer snapping a photo) — are directly from the sketchbooks he keeps. He related the importance of recording daily observations to building characters and plot points for his comics. In line with what Pedrosa has done before, there is a rich observational nature to Equinoxes, with few details escaping the artist’s attention. Bits of conversation spoken by passers-by pop up in word balloons and trail off on the metro, while anonymous museum goers giggle and text message one another. I’ve only just begun to dig into the book, but I’ve taken note of Pedrosa’s strong efforts to place us alongside his characters, or at least on the busy city streets in his story. Over the course of a few pages that appear early in the book, gulls swoop overtop a chatty outdoor market as a man and his daughter Pauline make their way to bins of jazz records. Pedrosa’s primary characters are adorned in bold watercolors — Pauline’s red tee pops against her steel-blue jacket, its weathered creases and pocket lines detailed in single inked strokes — and although figures lingering in the background are broadly swathed in mustard gold, Pedrosa doesn’t render them entirely unimportant to the scene. Bystanders are framed in distinct contour lines whether they’re in the rear of the action or not. There is conversation in the fore that nearly competes with the brief dialogue between Pauline and her father. It’s the kind of thing that’s easy to miss, but along with everything else that Pedrosa is scrambling to transfer from the scribbles in his sketchbooks, it’s part of his lively scenery, and it contributes a precise, realistic effect that shortens the distance between us and the often beautiful sequences rendered here. Images from The Solar Grid © 2016 Ganzeer. 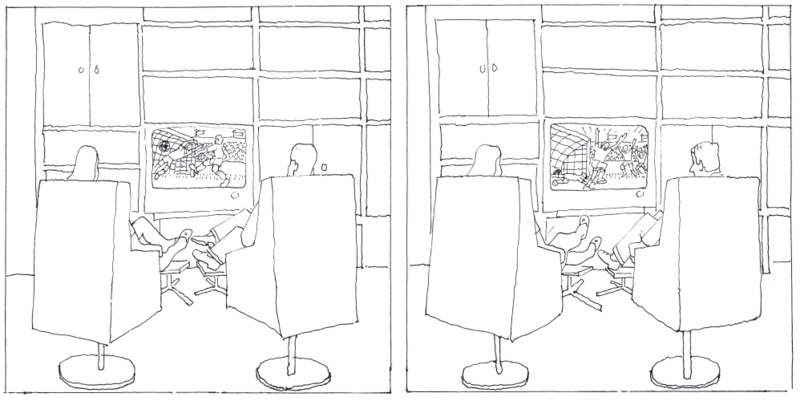 Images from Soft City © Hariton Pushwagner for New York Review Comics. Images from Equinoxes © 2015 Cyril Pedrosa.